Quite some time has been spent discussing with Richard the detail of the design of the overhead locker in the bedroom. It will be very large and we need to decide the internal layout. The front has been roughly cut and then scribed before being re-cut so that it snuggly fits the roof lining and the walls. Richard is going to make a “tunnel” in it’s base to match the porthole. There will be two large ‘lift-up’ locker door. Just to make the job interesting Richard is going to cut and trim each door around the porthole tunnel. All the doors in Waiouru are trimmed with 15mm oak and the bedroom locker doors will be no different. However the challenge is these doors will require curved oak trim to align with the porthole tunnel. So the first task was to work out a way of cutting some curved 15mm oak. 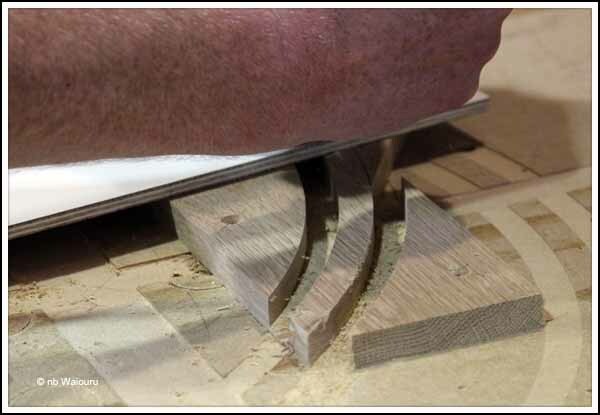 The agreed method was to cut the individual curved trim from 4” wide oak. 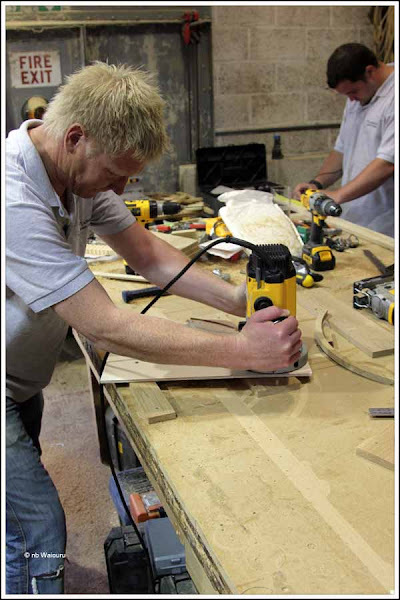 Richard made up a template and jig for the big router. 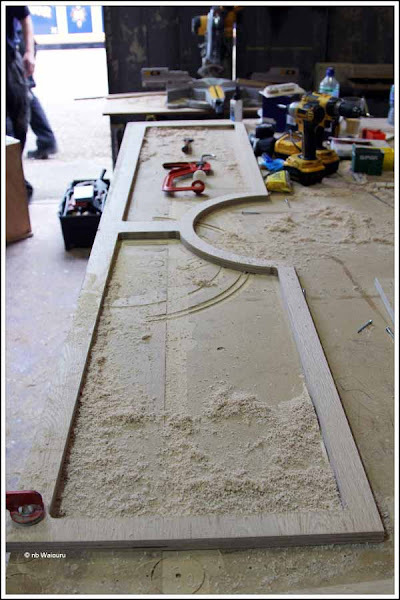 There is a curve on each door and the trim is required on both the door and the frame. So he needed to make four curves. In the end Richard decided to make one spare for each of the two curves plus a test piece. The technique involves cutting the outer face of the curved trim and then the inner face. The technique was successful and he now has 6 pieces of curved oak trim. The next problem was to work out how to cut the curve in each door and the frame. Same technique but a different jig. We started with a large sheet of oak ply and now look what’s left!!! At least you can see the shape of the locker doors.